Dr. James N. Hess, Jr. O.D. Dr. Hess is a lifelong Columbia resident. His parents moved to Columbia in 1967, where they were one of the first 100 residents in Columbia. Dr. Hess and his wife Cindy still live in Columbia with their two children. Dr. Hess graduated from Dasher Green Elementary School, Owen Brown Middle, and Hammond High School. He attended and graduated from Western Maryland College with degrees in physical education and biology. While at WMC he played soccer and lacrosse and was a member of the sports medicine team. Dr. Hess performed his graduate work and recieved a bachelors in science and his Doctor of Optometry degree from the prestigious Pennsylvania College of Optometry in 1993. Dr. Hess graduated with honors in the top 8 of his class. He was a member of the Gold Key International Optometric Honor Society and President of the Beta Sigma Kappa Honor Society. He coordinated tutorial service and clinic representatives. He also recieved several academic scholarships. After graduating, he began practicing primary care optometry at the Pearle Vision Express in the Columbia Mall. In August of 2002, Dr. Hess opened Columbia Family Eye Care in Clarksville full-time. Columbia Family Eye Care specializes in Comprehensive Family Eye Care, Contact Lenses, and Laser Vision Correction. Dr. Hess is a member of the Maryland Optometric Association where he serves on several committees. He is also a member of the American Optometric Association. 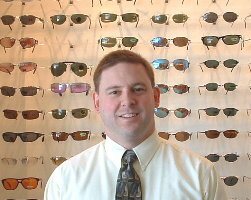 Dr. Hess was awarded the Maryland Optometric Association's Young Optometrist of the Year for 1999. He has also lectured and written for fellow optometrst on a variety of topics. When not practicing optometry, Dr. Hess enjoys spending time with his wife, children, mother, brother, sister-in-law and their children who all live in Columbia. He also enjoys remote control helicopters, surfing and swimming.